Thursday 19th February 2015 – 7.30 pm – All Saints Parish Church, Steeple Row, Loughborough. The public is warmly invited to a talk by Sally Strachey Conservation Ltd on how they are moving and conserving the War Memorials at All Saints Parish Church. The event is free but there will be a collection for church funds. The war memorials of All Saints and the de-consecrated Holy Trinity churches are being remounted at All Saints Parish Church. Specialist conservation contractors Norman and Underwood began work on Monday 19th January and will continue until mid-April. Individuals interested in visiting the church to see the work as it progresses should contact Bill Brookman of the Charnwood Great War Centenary Project on 01509 236175 or 07792 655 670 or by email at bill@billBrookman.co.uk. School groups interested in visiting can contact Madeleine Coburn at mc-candcc@live.co.uk to arrange a special tour. Photographs of the work to date can be seen here. The culmination of the repositioning of the memorials is to be marked by Charnwood Orchestra’s ‘The Banks of Green Willow’ concert at All Saints Church, Saturday March 21st 2015. 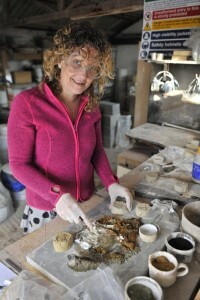 Conservation expert Lisa Etherington will be answering questions on the project work on 19th February.